Your choice of contractor has the potential to make or break your project. Make sure you choose an experienced contractor like Cabinet Magic for your Kitchen remodeling in Diamond Bar CA. Cabinet Magic is a licensed contractor with the skills and experience required to guide remodeling projects of any size or complexity to completion. We seriously care about client satisfaction and we will work hard to make sure you love your new kitchen. When you’re just changing one aspect of your kitchen, such as your countertop or your flooring, it’s not too difficult to imagine the finished result. 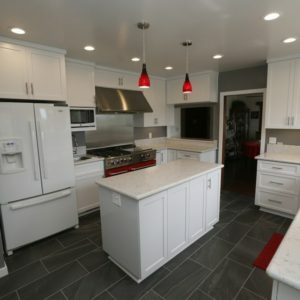 However, the more complex your kitchen remodeling in Diamond Bar CA is and the more aspects of the kitchen you change, the harder it is to really visualize what you’re getting yourself into. After all, samples can look quite different in your hand than installed in your kitchen. At Cabinet Magic, we believe being able to accurately visualize your kitchen remodeling in Diamond Bar CA before work begins is key to being satisfied with the final result. That’s why we offer 3D computer rendering services on every remodeling project. We’re happy to create multiple versions of the design so you can easily compare different options. We never begin work without your sign off and approval of every detail of the design. Most people opt for custom cabinetry because they want a truly unique look with cabinets perfectly suited to their style and their space. But custom cabinetry also delivers another very important benefit: custom functionality. After nearly 30 years in the business, our skilled craftsmen have truly mastered the art of custom cabinetry. We can match any architectural style and also include all kinds of functional accessories from lazy susans to pull-out trash bins to appliance drawers and more. We are true perfectionists and we take great pride in delivering quality cabinetry that lasts. Take the first step towards beginning your kitchen remodeling in Diamond Bar CA today by contacting Cabinet Magic at 800-828-4380 and requesting your free in home consultation. We’ll be happy to share ideas and provide a free estimate for the project.